What you need to know about gum disease. 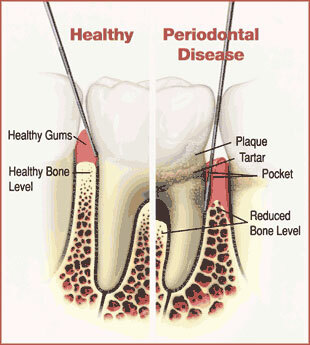 Gum disease can cause your gums to bleed and become infected, swollen or tender. As a result, the infected gum starts to separate from the teeth and a pocket develops. If left untreated, this infection can spread to the bone and cause bone loss. Furthermore, this infection can not only result in losing your teeth, but can also spread to the rest of your body. Periodontal disease has been associated with heart disease, diabetes, premature births and a slew of other systemic health problems. When inflamed gums (gingivitis) is not treated the infection will work its way down towards the bone causing the gums to separate from the tooth making a “periodontal pocket”. It is difficult for patients to keep these types of pockets clean. Scaling and root planing (also known as Deep Cleaning) is the thorough removal of plaque and tartar under the gum line. It can be done either in one or two visits. If you are interested in our Periodontal services or other restorative solutions, please call 516-933-3444 Broadway/ 516-798-3444 Sunrise to schedule an appointment!